Anti-Bullying Interview: Have You Had ENUF? 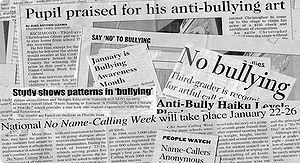 Bullying is unacceptable…anytime and anywhere! We all know that…but what can we do? Yvonne Pierre, founder of ENUF (Ending Negativity to Unify Families), is doing quite a bit. I was honored to be asked by her to be part of her Have Ya Heard Innerviews…I hope you will click on the link to read it. This entry was posted in Bullying, ENUF, Guest Post and tagged Bullying, positive parenting, Violence and Abuse, Vivian Kirkfield, Yvonne Pierre by viviankirkfield. Bookmark the permalink. Enjoyed your interview. And, I welcome the information on the organization. And, thanks for introducing me to Kids are Heroes — wow! Great organization, and loved the interview! Excellent information on a good organization, Vivian. You always keep us informed!